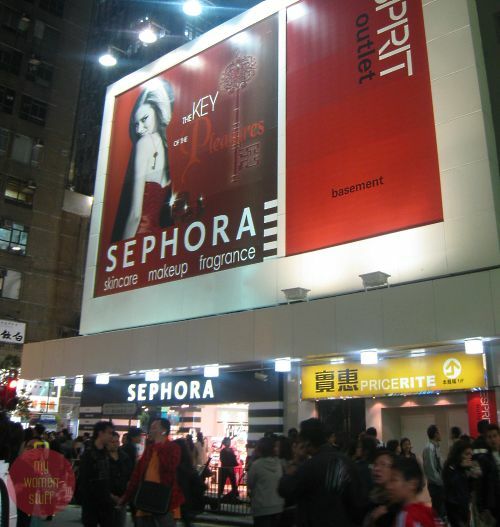 Home » Travel » Presenting Sephora Hong Kong! The last time I was in Hong Kong, all I saw was the hoarding promising something new to come. This time, I managed to stroll right into the Sephora store and see the real thing! 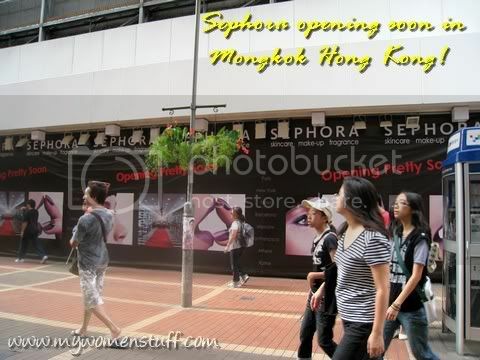 Here is a picture I snagged of Sephora Hong Kong located on the busy Sai Yeung Choi St. in Mongkok, Kowloon. Its hard to miss and is located next to the Esprit Outlet store. There are 2 stories of cosmetics, skincare and bath and body goodies, but I walked out of the store with nothing in hand. That’s right, I do not have a Sephora bag to show for my troubles! I found Sephora Hong Kong a bit of a let-down. Its just like walking into a Sasa store except the product selection is much smaller (and there were less people). The brands available are mostly brands you see in most department stores – Estee Lauder, Lancome, Dior etc. There was also counters for Benefit Cosmetics, Make Up For Ever, Smashbox, Calvin Klein, Stila, Nvey Organic makeup and of course, Sephora’s own line. I was tempted by the Smashbox Spring Muse Artist eyeshadow palette but at HKD550 (RM270+) or so, I felt it was way too expensive. 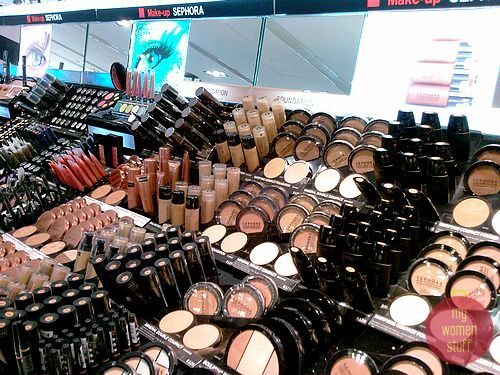 The Sephora brand of makeup were pretty affordable, but nothing interested me. So, after walking around the store for a bit, I left empty handed. In fact, this time, I found prices of cosmetics in Hong Kong higher than in Malaysia even on sale or at the duty free stores at the airport. This includes Japanese drugstore makeup – Kate and Majolica Majorca as an example, is slightly cheaper here. Those who have been upset at Benefit Cosmetic’s recent price hike in Malaysia would be apoplectic at the much higher prices of Benefit in Hong Kong! So whilst we may not get the latest stuff immediately, I’m not above waiting a month or two to get them here at sometimes substantially cheaper prices. I suppose I’ve had all this grand illusions about Sephora after reading so much about it that I’ve built up this image in my mind about how grand it is or should be. So, when I realized that its just another cosmetic department store, things just settled down and I felt rather disillusioned. I prefer browsing through Facess in Hong Kong – there are more international brands available and more interesting stuff on display (and I prefer jostling with people because it adds to the fun 😉 ). So my little sojourn in Hong Kong is why I have not been replying to your emails and comments recently but I’m in the process of catching up. Are you wondering what I did get from Hong Kong at the end of the day? You have to stay tuned then don’t ya?! 😉 Oh and I also updated my makeup shopping tips in Hong Kong for anyone interested. I’ve been trying to find/Google places in Hong Kong that sell the Shu Uemura Eyelash Curler for cheaper than US prices. Do you think (on wishful thinking) that the eyelash curler is cheaper at the Sephora in Hong Kong than elsewhere? I’ve tried asking my mom to check as many SaSa’s in Hong Kong to find the eyelash curler but they no longer carry it! What do you think 🙁 ? The Shu Uemura eyelash curler can be purchased from Shu Uemura counters in Hong Kong. I know there’s one at Facess at Harbour City and at DFS Galleria. Probably at Times Square and Lane Crawford too as well as Sogo in Causeway Bay. I can’t remember if Sephora in Hong Kong has a Shu Uemura counter but if it doesn’t go to any major department store – it should be there and it should be cheaper than in the USA. HTH!